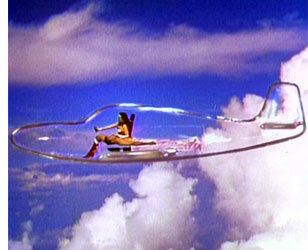 aGupieWare: Windowless Planes To Provide Amazing High-Res Views? Windowless Planes To Provide Amazing High-Res Views? If you like flying so much that you can't bear to be away from the window seat, there may be an exciting new technological breakthrough you'll enjoy. A new design for a windowless airplane that recreates scenery in high definition inside the airplane cabin could revolutionize how you see the skies. Technicon, a Parisian design company, has drawn accolades for their new IXION Windowless Plane Concept. Using exterior-mounted cameras, a 360-view of what's going on outside your aircraft could be displayed in glorious high-def for your in-flight entertainment. Amorphous solar panels on a windowless fuselage would help to power the displays. The imagery itself could be anything - your flight over Kansas could magically become a leisurely lift over the Hawaiian islands, or even space-based scenes. Parallax balance technology could allow for separate viewing screens, if you absolutely HAD to watch some boring business presentation during your amazing all-seeing excursion. While this is still a concept in development for the private planes of the future, it's nice to know that even something as awesome as flying can still get even better. Wonder Woman has the right idea.